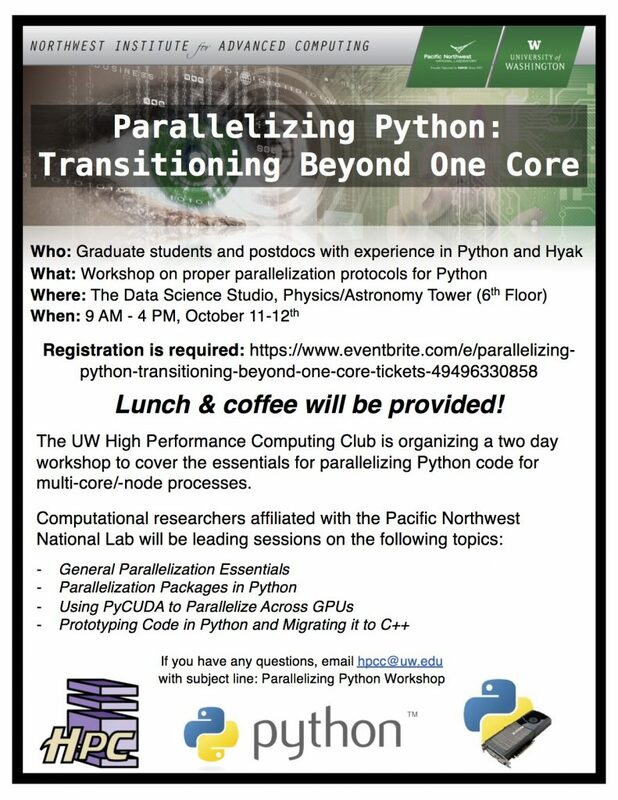 We are happy to announce that the RC Club will be hosting a workshop on parallelizing Python code. Specifically, the workshop will focus on scaling your code beyond a single core or even a single node! We will be collaborating with members from the Northwest Institute for Advanced Computations (NIAC) and Pacific Northwest National Lab (PNNL) to run a 2-day workshop on October 11th and 12th (9am – 4pm both days). This workshop is only open to graduate students and postdocs with experience in Python. Please discuss with your lab mates prior to registering as we are asking that there are no more than 3 members from a single research group attending the workshop. This is to ensure that we have a diverse audience across multiple disciplines. Previous story Welcome To Research Computing Club!